Description: A taller growing, ornamental shrub or small tree of 4 m to 5 m in height. 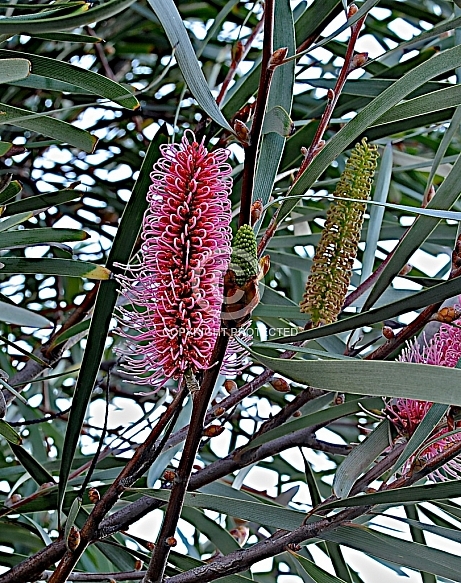 Deep pinkish-red, cylindrical flowers up to 80 mm long are borne in the axils of the leaves during winter. The broadly linear leaves are a feature, being up to 26 cm long and just 6mm wide. Alkaline, sandy soils are preferred but generally a range of very well-drained soils in sunny positions should be conducive to successful cultivation. Light frosts are tolerated.